After two weeks alongside at Shieldhall discharging her cargo of plywood, which could only be done during reasonably dry weather (readers of this blog may have noticed that the weather has been somewhat variable recently! 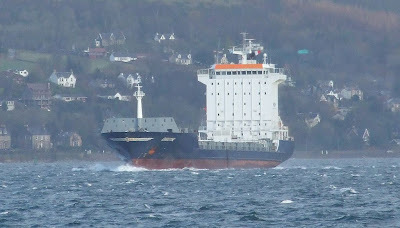 ), the 2005-built container ship CHRISTINE finally completed her cargo operations and sailed this morning. She was bound for Vlissingen (also known as Flushing), a Dutch port near the mouth the the Schelde estuary.